Who’s ready for Retrograde Fever? A look at how transits to your natal chart affect how you handle being alone, and who you are most likely to attract into your life. 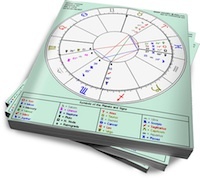 The couple who connect through a conjunction of Mars and Pluto can create mayhem and madness for themselves and those in their path. If you want to put an end to your stress and lack of mindfulness, here is how to jumpstart your spiritual awakening today. Click on the wheel for today's aspects.